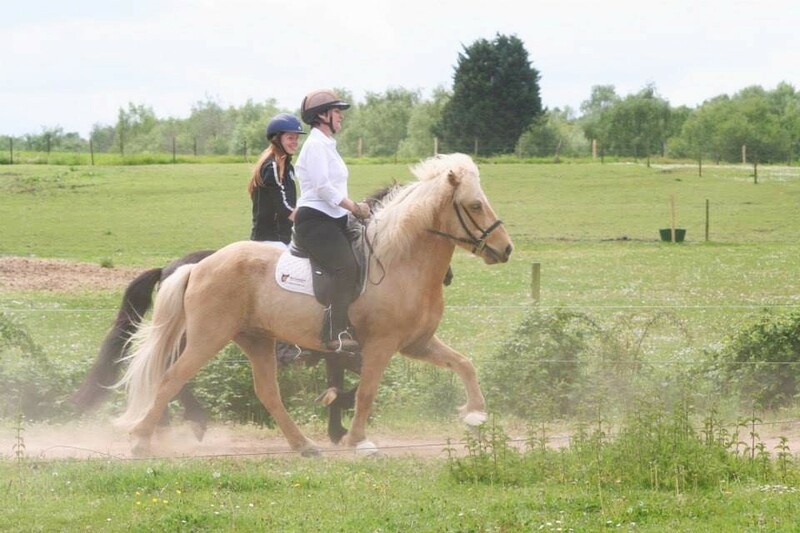 Roger has often said that ‘horses are a lesson in humility’ and on the journey to success it is helpful to remember that sometimes you will take two steps forward and one step back. In my last blog I wrote about how well Fleygur had done at the Spring Show, mainly because of how relaxed he was. Since the show he has improved even more, bringing his back legs under himself to power from behind and producing a much nicer and relaxed walk. Roger has been using a number of exercises to relax him, get him listening and into the the right shape. We had high hopes for the British Championships, though tinged with a little apprehension. 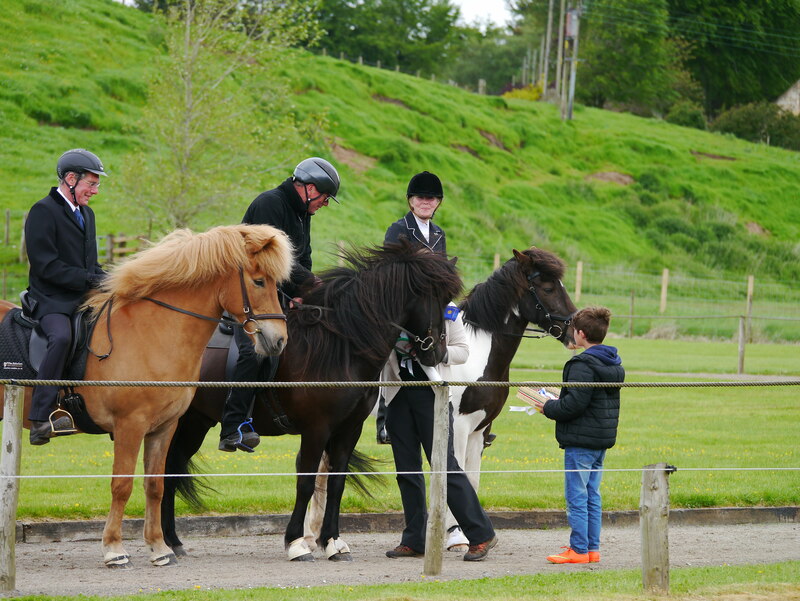 The British Championships were being held in West Linton, Scotland, a place Fleygur had never been, and we suspected that part of his success at the Spring Show was his familiarity with Oakfield Farm. 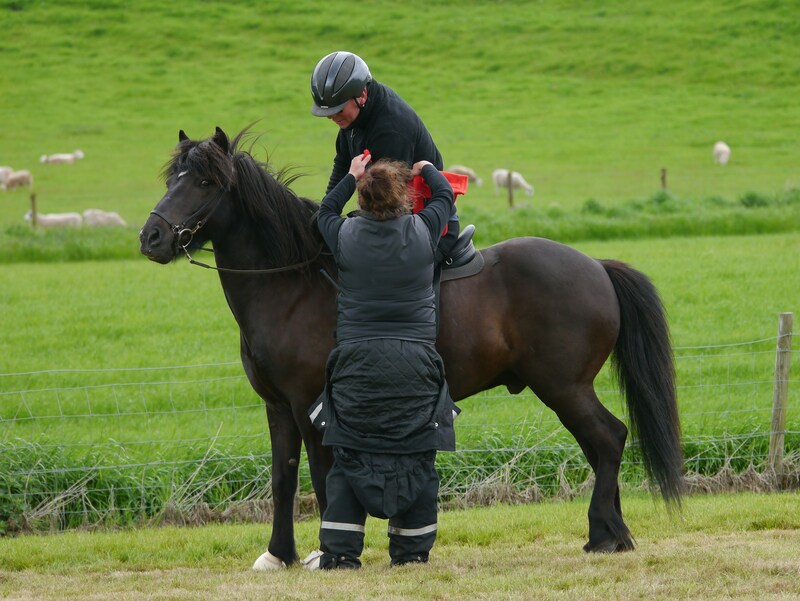 During preparation for the show Roger was having problems with Fleygur’s floating panel saddle slipping forward. When it stays in the right place it’s great, but too far forward and the panels press into his shoulders. When we bought him he wore a crupper, but Roger was concerned about how this might effect his spine, and Fleygur didn’t seem to like it much. Two weeks before the Championships Fleygur’s new Top Reiter Start saddle arrived and he seemed to go well in it. For my part preparation for the show was difficult. Work commitments took me away from home so I couldn’t ride much and I had developed a sore back which was taking time to heal. 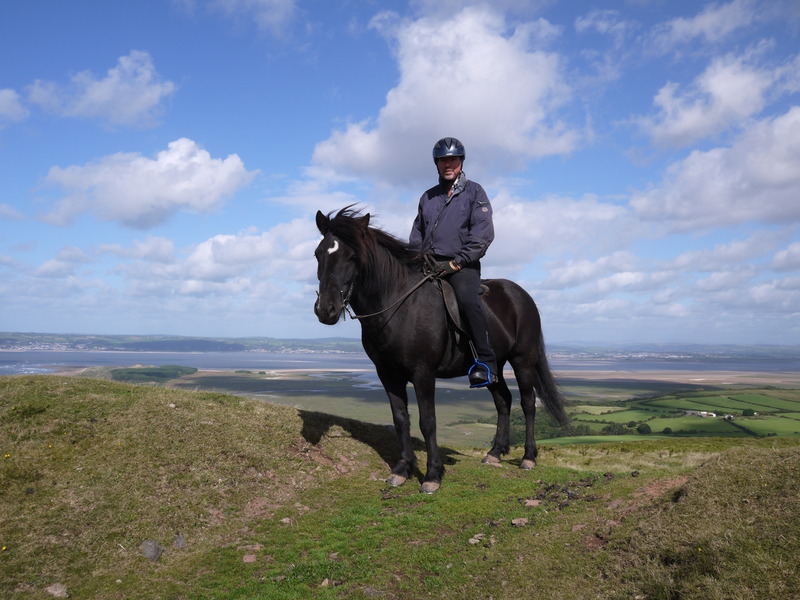 I could not get time off before the Show, so Roger took the horses to Scotland on his own on the Thursday, and I joined them on Friday night. On route to the British Championships. A seven hour trip. 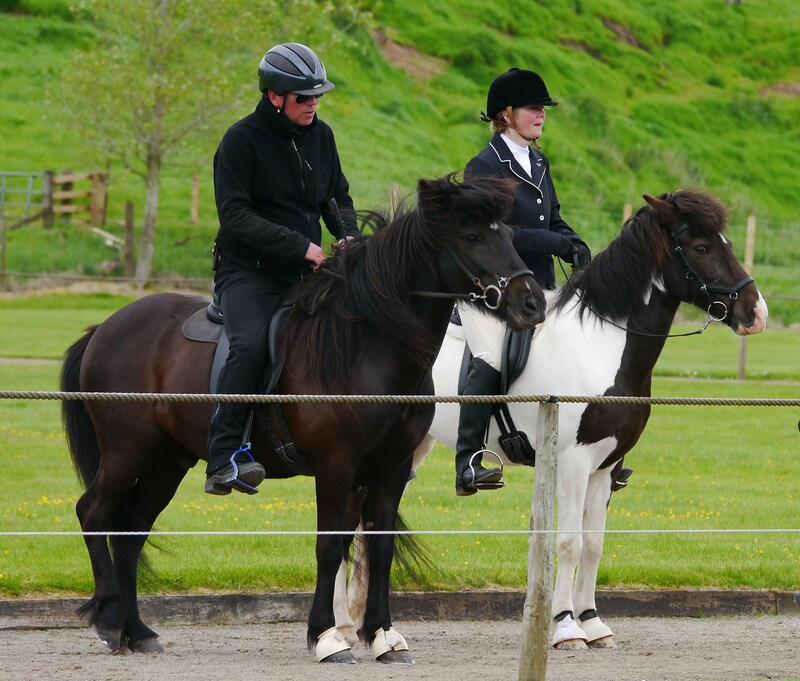 On the first day of the Show Roger had the opportunity to attend a short clinic with a top rider, Charlotte Cook. 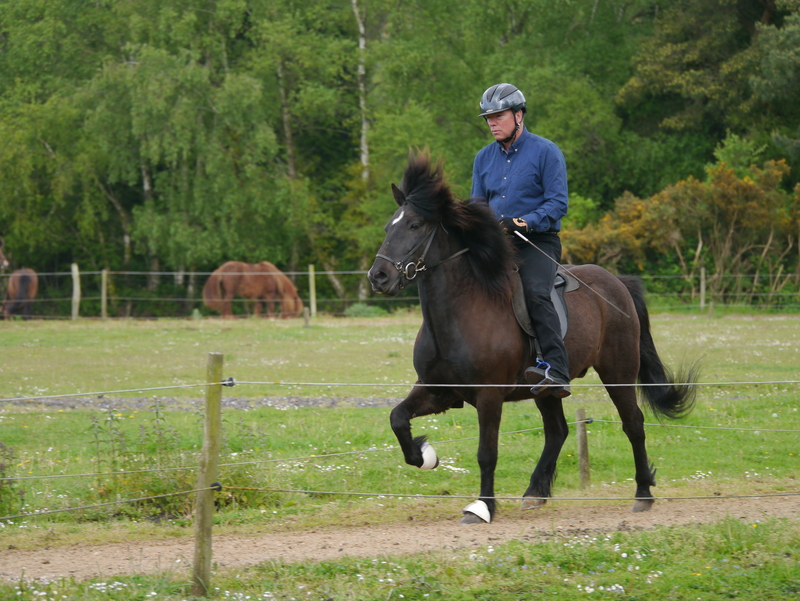 Fleygur went well and with Charlotte’s help Roger was able to improve his performance even more. The next few hours for Roger were spent organising and running the Track and Trail class ( a new innovation for the BCs). I would love to enter this myself sometime but even though I had designed it my work commitments meant I couldn’t even get there to supervise Roger! After running around all day later that evening Roger picked me up at Edinburgh station and we went to bed late and exhausted. So Saturday morning found Team LVH all together and ready for our classes, or were we? 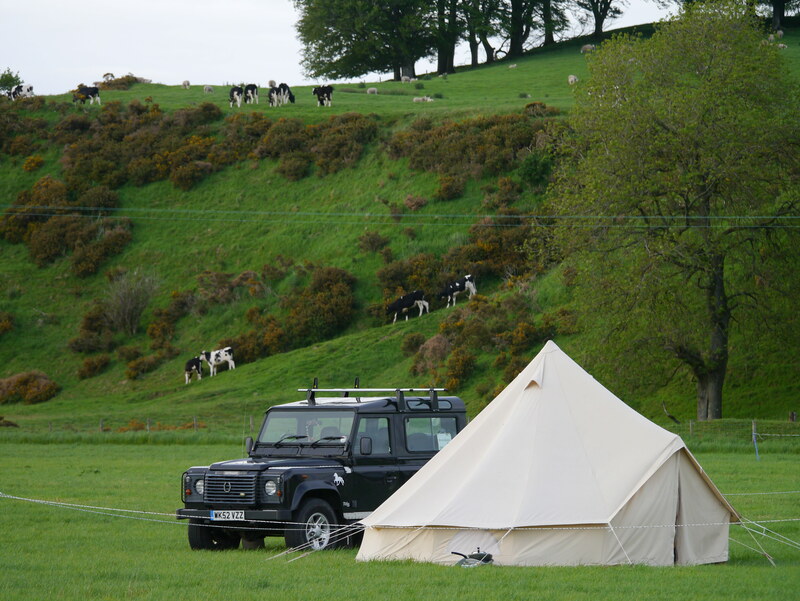 Camp LVH – for Horses! 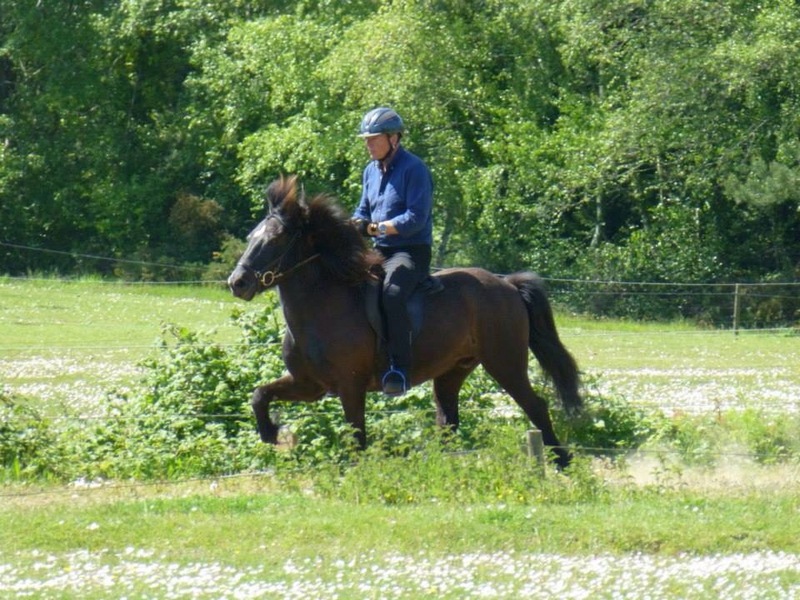 Fleygur was entered in two classes the first was Intermediate Four Gait, where he has to show walk, trot, canter (on the correct lead) and slow and fast tolt.The second class was Intermediate Tolt, requiring slow and fast tolt. Because this is the BCs I couldn’t help Flegur with his anxiety by having Svipur in hand near to the track, and the lay out of the event meant that the track was along way from where he really wanted to be, back with Svipur. It was immediately apparent that Fleygur was not happy. For both events he was difficult to mount, when he doesn’t move a muscle usually and as soon as Roger was on board he was trying to take off. For the first time ever he was also napping and refusing to go forward. 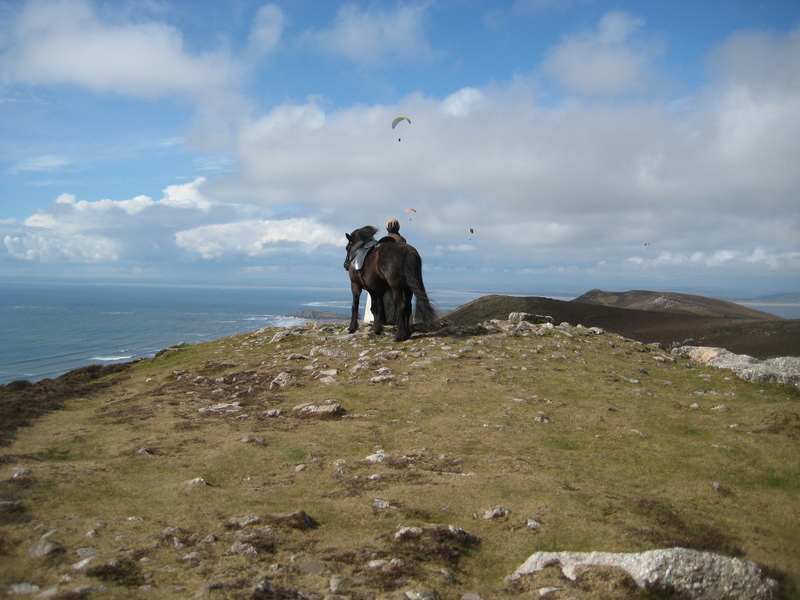 We had never experienced this with him before and Roger had to use all his strength and riding skill he had just to keep Fleygur going forward and to stop him from going up. Trying to use more subtle aids and small moves to improve listening and shape were abandoned in favour of just staying in control! Oh no, not the armbands! 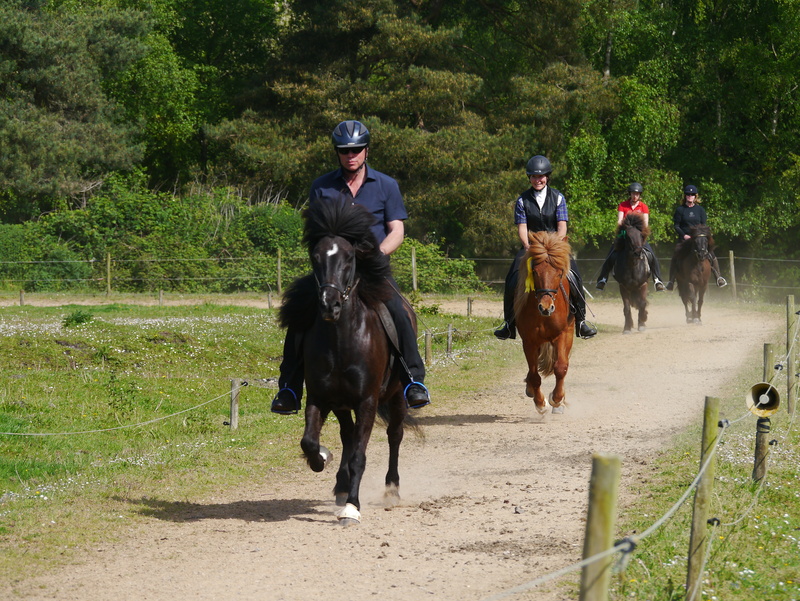 Roger struggled in the Four Gait to get four gaits and barely managed any trot at all! To get trot Fleygur has to relax and lower his head, and this just wasn’t happening. 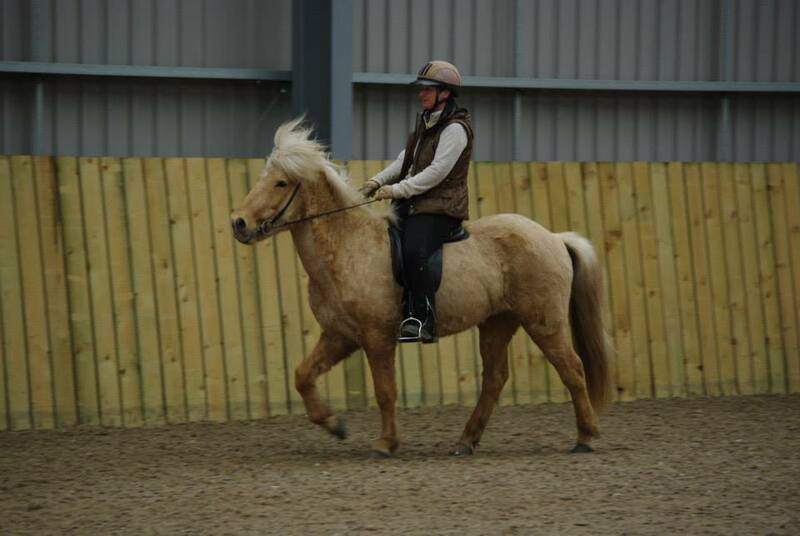 Canter wasn’t much better and I could see that Roger was struggling for control. However despite all this he did manage to scrape though into the final albeit in last place. His tolt class was much better and although I have seen better slow tolt, his fast tolt was good and he went through to the final in the leading position. In between him fighting with Roger he did produce some nice gaits, and he wasn’t shouting so we hoped that by the finals day he would have settled and could be in with a chance. Now it was my turn with Svipur in the Elementary Tolt. At the lunch break, having not ridden Svipur for a week or had the chance to show him the oval track I led him in hand through the warm up area and up to the track. He was really on his toes and by the time I put him back in the paddock I was starting to feel nervous. When the time came however he calmed nicely with my usual pre-hack exercises which include ‘kissing the stirrup ‘, responding the pressure by flexing at the poll, a bit of rein-back, and generally moving his feet around. All the stuff that completely failed to work with Fleygur earlier. However I completely underestimated the time before the class and barely got any tolting in before I had to be in the collecting ring, where I found I had to lead the class in. This is a disadvantage on Svipur, as he will go better on the track with a lead. I was just getting into my rhythm when Svipur spotted a rake lying by the side of the track, a track he had never been on and he was out front, and obviously it was there to eat him! Despite not being a spooky horse he spooked sideways and stopped dead! He went on again almost straight away but by now I had lost my rhythm and was guarding my sore back and we never quite recovered. As a result his tolt was inconsistent and ‘rolling’. I was called for a tack check so didn’t hear my scores but I knew it hadn’t been a good performance and although we didn’t come last, we didn’t make the final. 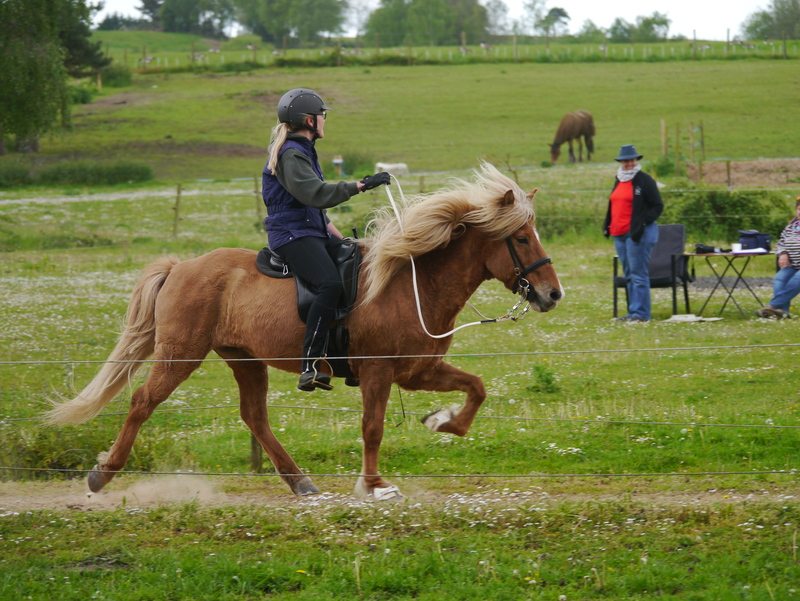 Tack check is a standard part of Icelandic shows to ensure that tack is within the rules and correctly fitted and that the horse does not have any injuries. In the preliminary rounds this is done on a random sample, and in the finals all horses are checked. I was really down about my performance and to be honest I had not been in a great mood since I had arrived. I was tired and felt under-prepared. I definitely was under-prepared. Note to self: I can not just swan up to a show at the last minute, having not ridden my horse much in the last few weeks, do barely any warm up and take him on a track he has never seen before and expect a good performance! The best advice for Roger and myself that afternoon came from Charlotte Cook. For Roger ‘focus on what went well’ and for me ‘get your horse on that track this evening’. So after the days events had finished I tacked up and did just that. 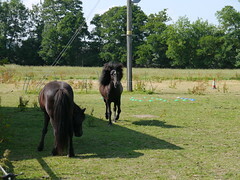 Svipur behaved perfectly, no spooking and we did some nice tolting with a bit of coaching from Roger. I tried to get a little trot too, Svipur’s weakest gait, but despite me thinking I had trot Roger told me it was pace so I stopped. I don’t want to teach him ‘piggy pace’! I think I will need some help with knowing what my horses feet are doing, and can feel some more lessons are needed. 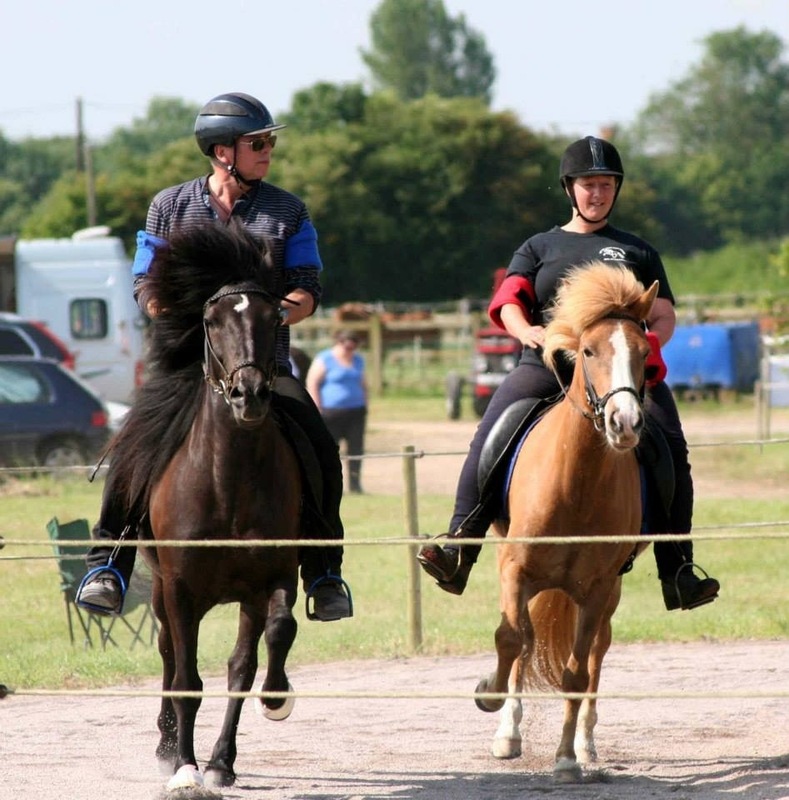 Roger took Fleygur for one round of trot, just to prove he could and we called it a day. The evening was spent with the other competitors and visitors, a meal, giving out some prizes, thanks to those organising the event and some silly games (for those that didn’t sneak away at this point!). 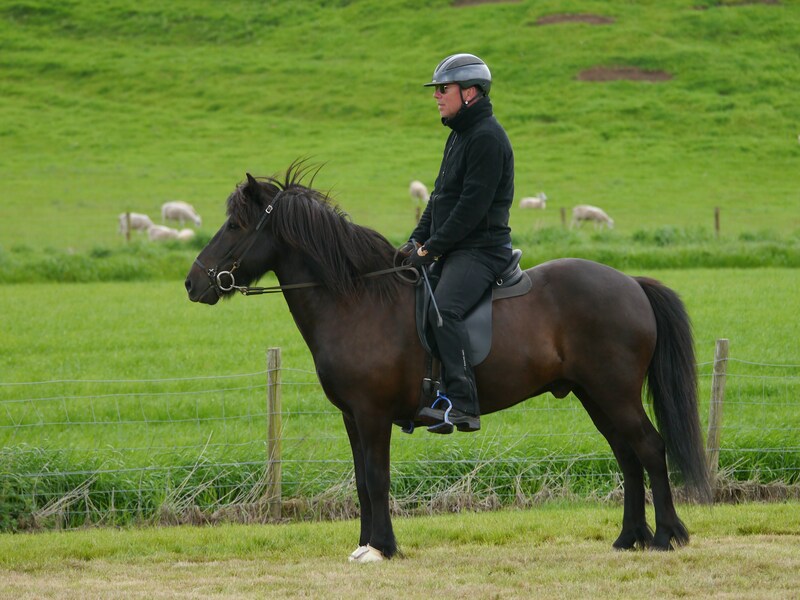 The Icelandic Horse people are a friendly and supportive bunch. Finals day arrived. As I didn’t qualify for a final had the option to ride in a ‘Three from Four’ class, but I declined. I already knew I couldn’t get trot and I didn’t want another poor experience on the track. I would rather keep in my mind the nice tolting I had done the evening before, besides the class started at 8am and I needed my rest! Instead I spent the day being groom for Roger. Fleygur was not much better and was still difficult to mount and handle. Now we were questioning everything. Did the new saddle fit after all? Was he in pain? May be it was just that he didn’t know the place. Should he just do tolt classes, avoid group classes, should we show him at all? Roger tried to focus on the positives, Fleygur had shown a nice fast tolt, and his trot when he does it is good. He wasn’t shouting and anyway he was going into the final in his first class in last place so what did he have to lose? I advised Roger to treat it as a warm up for his Tolt final. It worked! 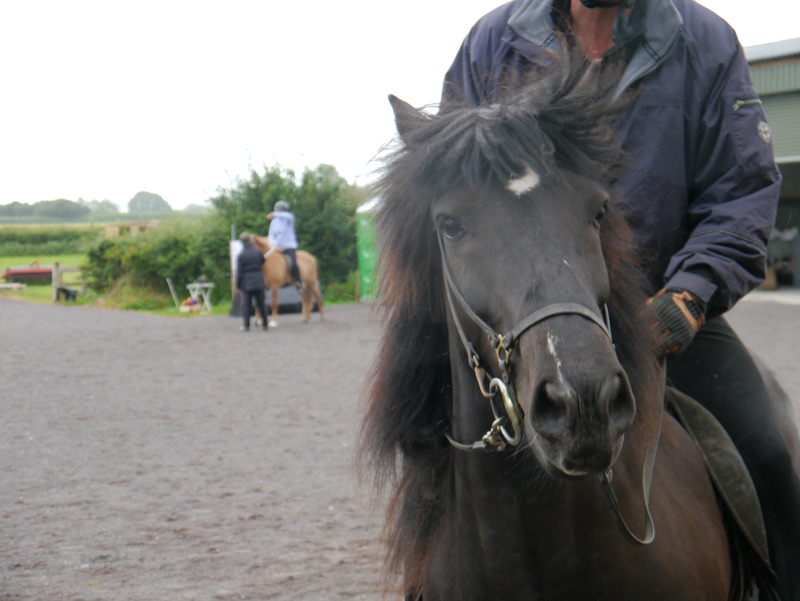 This time he got all the gaits and managed to move up two places winning a fourth place rosette. It had been a struggle though and even at the end Fleygur didn’t calm down and fizzed about on the track. I can’t help but wonder how well Fleygur could do if we can get his anxiety under control. That horse is giving me a funny look! His last class was Intermediate Tolt final but Fleygur was still fighting, and he didn’t go as well as the day before. He dropped from first place to third and as if to underline his fall the skies opened and chucked down a load of hailstones. Welcome to midsummer in Scotland! 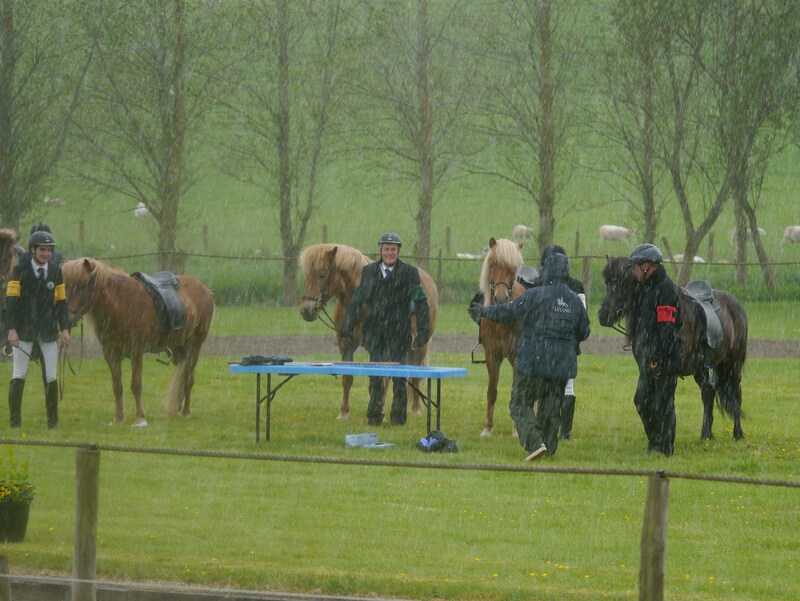 The final Tack Check accompanied by hailstones! 1. Always bring rain sheets (what ever the time of year). We did take them, but we didn’t for our first show in 2013. 4. 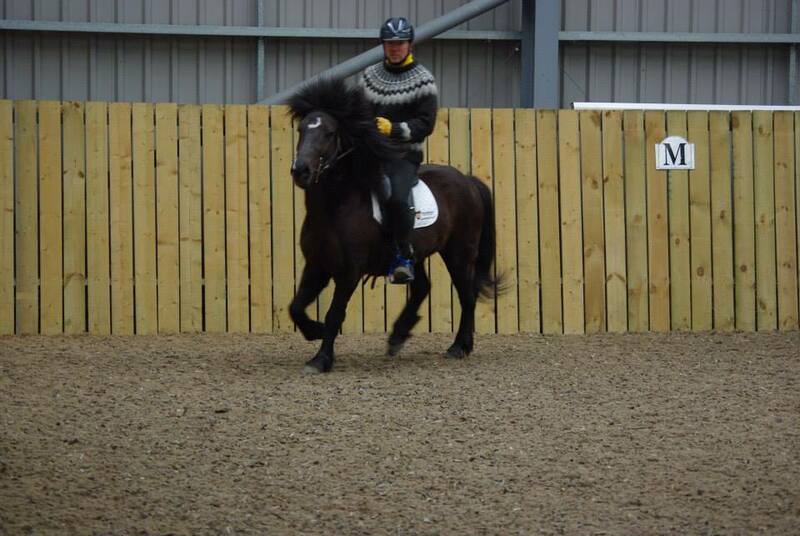 Always use the same warm up routine, different for each horse. 8. 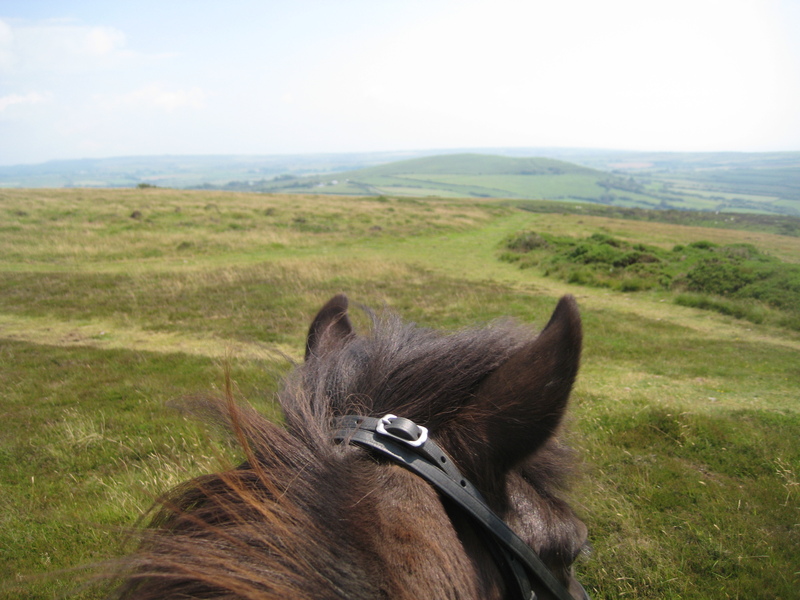 While out hacking do timed tolts and trots to match the classes. 10. Have an honest debrief on what we have learned on the first night, and write it down. 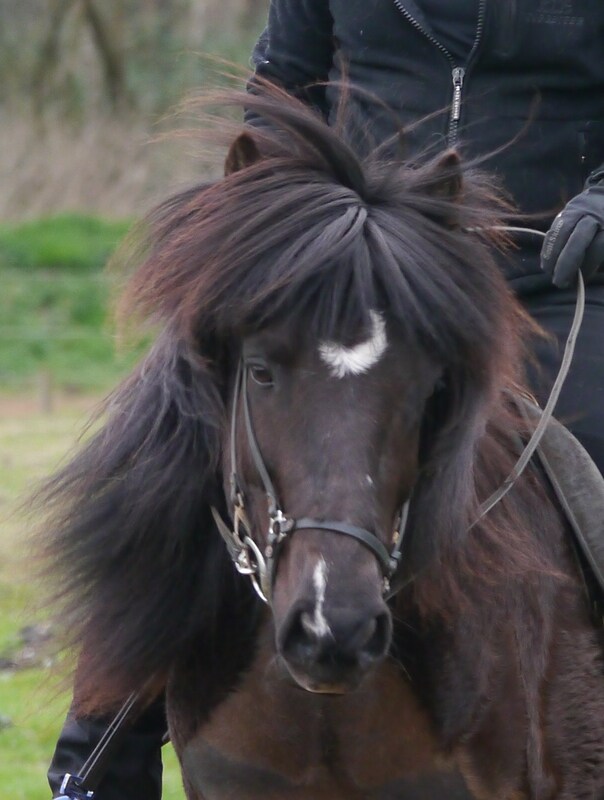 Little Viking Horse usually writes his own reports on the shows and whilst not doubting what an awesome horse he really is I thought his fans might find it interesting to hear a more balanced view of his achievements and some reflections on how far he has come. Fleygur’s performance at the Spring Show was my favourite. Of course there were horses there that were more powerful, more flamboyant and more talented, but I was delighted with him. I was delighted with his recent performance, not because he won his Intermediate Tölt class and came a very close second in the Intermediate Four Gait, although of course that was great, I was delighted because only a few weeks earlier we discussed withdrawing him from competitions all together, and this could have been his last one. He really pulled it out of the bag at this show and achieved some good scores and placings, but the main reason he will be back is that Fleygur seemed so much more relaxed and Roger wasn’t having to fight with him all the time. They have come such long way since their first ever show, the British Championships in 2013. I could add that as winter was approaching and his owner was keen to find him a new home as soon as possible his price had recently been cut in half and Roger always likes a bargain! Fleygur continued like this for some months. He did everything you asked of him, but he was always anxious when ridden out alone. He didn’t spook but he lent on the bit and pulled, all the time. If you gave any release he would take off with you and I have never known any horse walk so fast on the way home, an uncomfortable short choppy walk. Even when I hung back on my cob, if you let him Fleygur would continue his speed march home disappearing out of sight round the corners. I once got so fed up with him marching home that I made him stop and insisted he stood still. If he moved I was determined to stand still longer, I now think that it was a silly battle of wills that was not really going to teach him anything, but I was so frustrated and uncomfortable it was what I resorted too. The thing is he stopped every time I corrected him but eventually he started trembling and I could feel him starting to boil over. I really thought he might go crazy so I jumped off and walked him for a bit. He immediately calmed down and I was able to remount and ride him home. I stopped riding him. He was too strong for me and I didn’t like the amount of contact I needed just to have some sort of control, and anyway he was Roger’s horse! After we had owned Fleygur for about six months Roger developed a sore back and the more he rode Fleygur the worse it got. 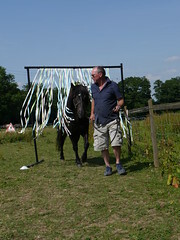 In all other respects he was a lovely horse to have around. A real character, quick learner and a dream to handle on the ground, but this wasn’t going to work and Roger said we would have to sell him. Being the sentimental one I offered to swap horses for a while. 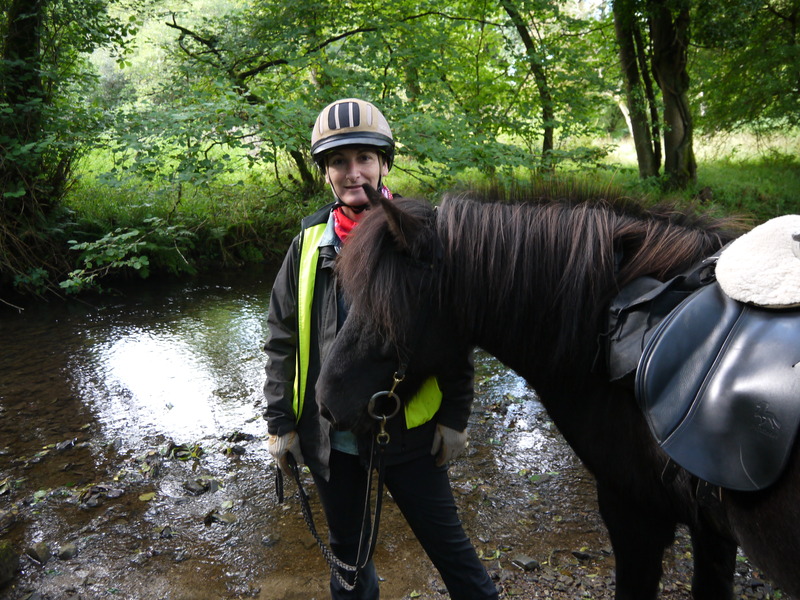 I was hoping Roger would be able to sort out his back and we could keep Fleygur, so for three months Roger got to ride my lovely armchair Cob, Beanie and I was back on the horse that use to make me cry with frustration. Over those months a number of things changed. We changed his French link snaffle for a Waterford, which he couldn’t lean on in the same way and gave me something to work with. 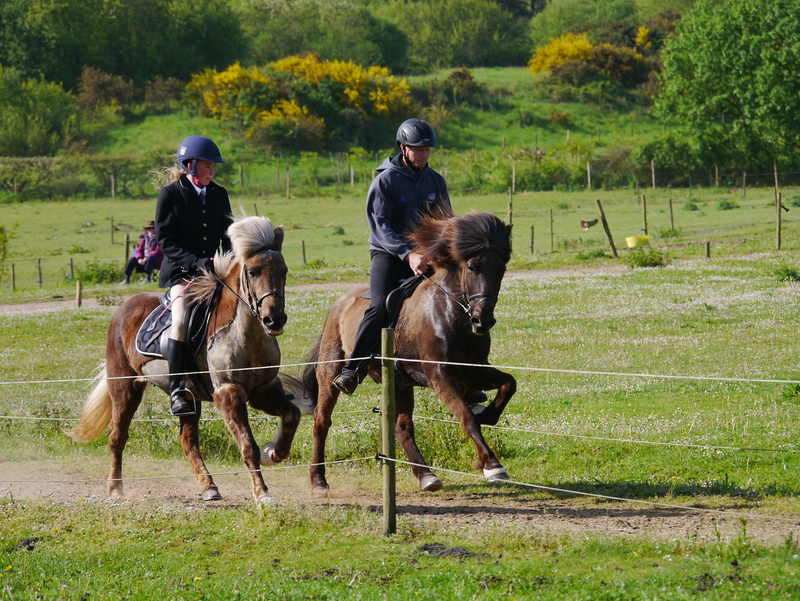 We went to Iceland where we rode lots more horses and had some lessons. 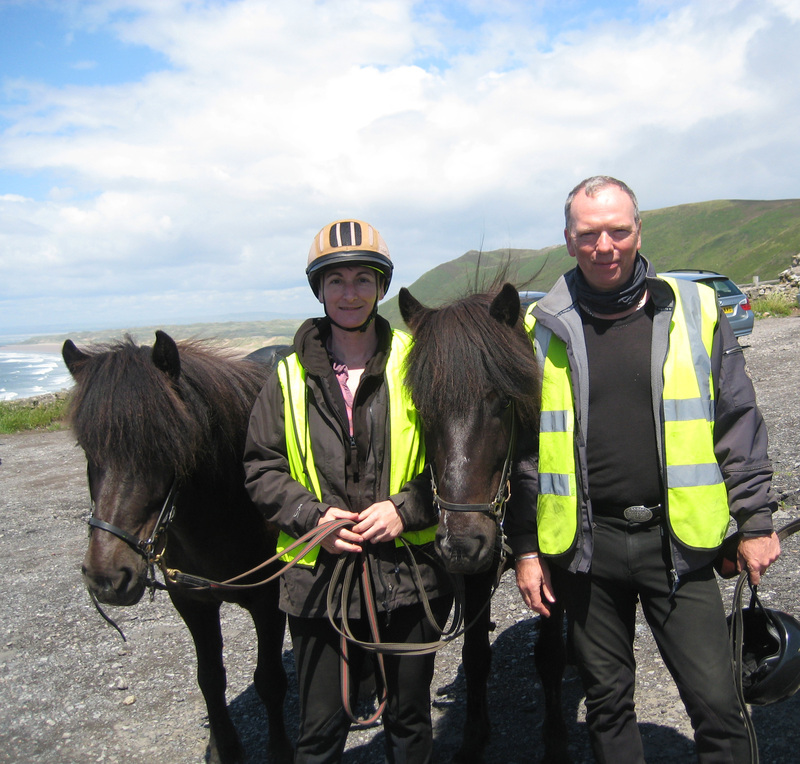 We asked everyone we met, in Iceland and back home about how to deal with horses that pulled. I tried really hard not to ‘pull back’ and to get him to relax but the progress was so slow I barely noticed it. We didn’t really know other people with Icelandic horses back then, and before the days of Facebook groups it was much harder to make and keep the links and find out what was going on. 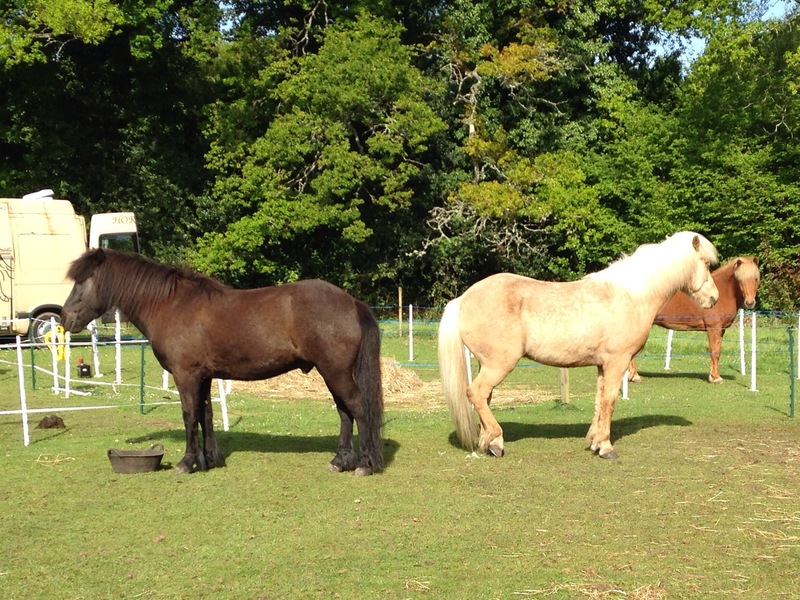 We visited a Western Equestrian Show locally which seemed to be the antithesis of the riding we were doing with Fleygur, nice quiet calm horses all on a loose rein. It was clear that Roger was seriously thinking of going back to Western riding and buying a Quarter horse. 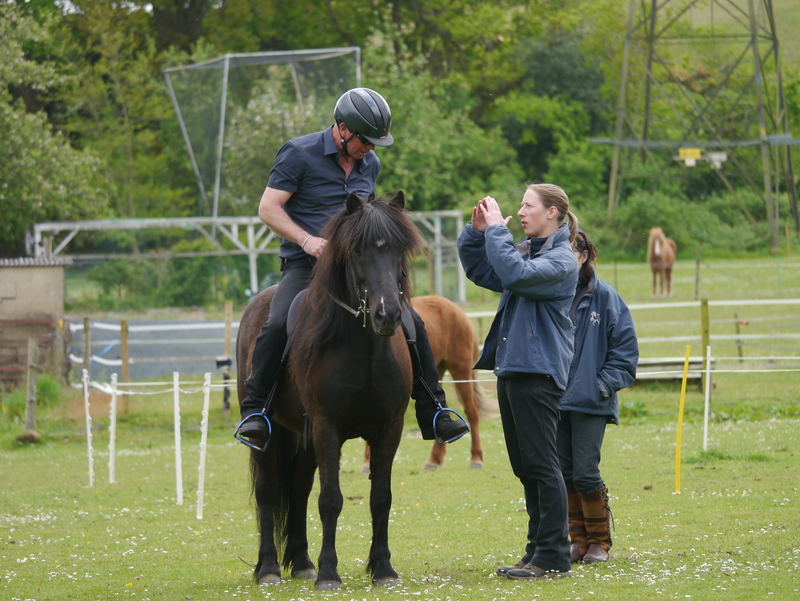 At the event we met a human and equine physiotherapist who gave Roger a treatment and recommended he reviewed his riding position. We decided we needed to know more about Fleygur and contacted his breeder for help, We booked a lesson with Janice Hutchinson at Siamber Wen Icelandic’s where we discovered that Fleygur had always had a good tölt, and that he use to have a nice trot too, though we had not been able to find it up to that point, but we also found out that he had always been an anxious type of horse. 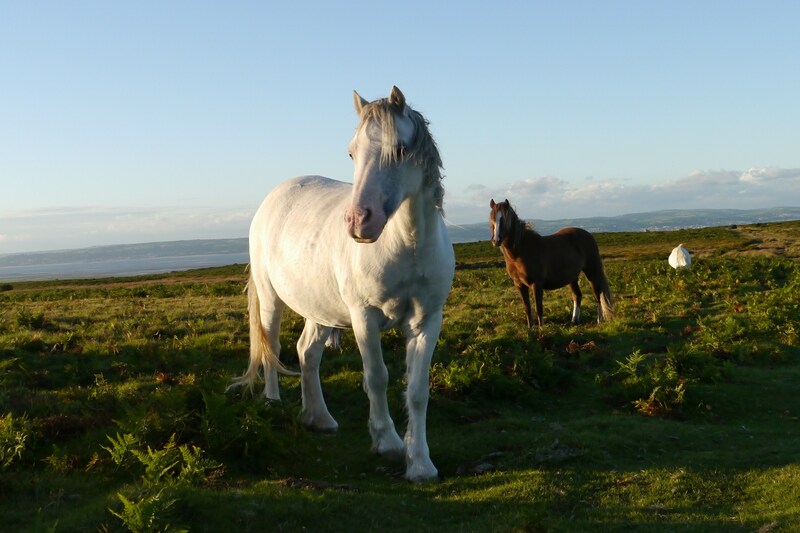 It appeared that Roger was right, he was a ‘good stamp of a horse’, but he did have issues! 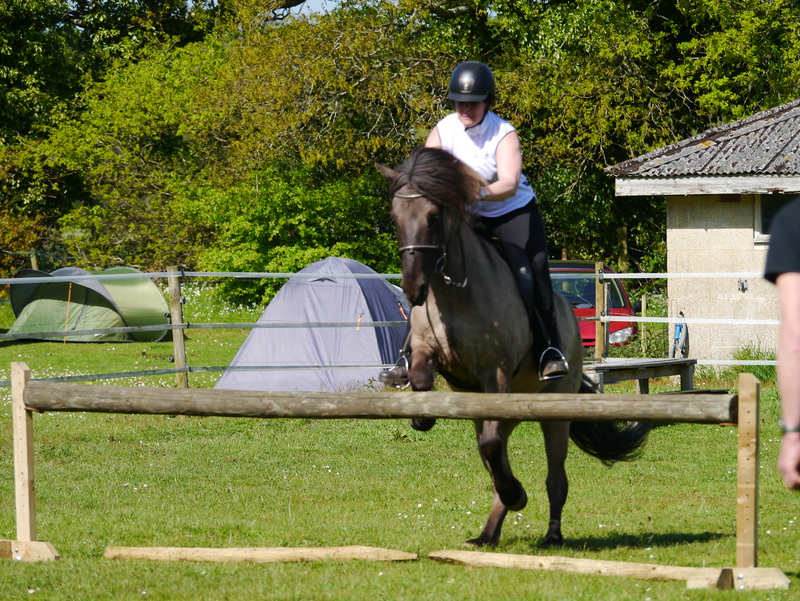 Janice told me I might make a good enough rider in a couple of years time if I worked at it and although I had only recently returned to riding, I had ridden since I was six so I took this quite badly! 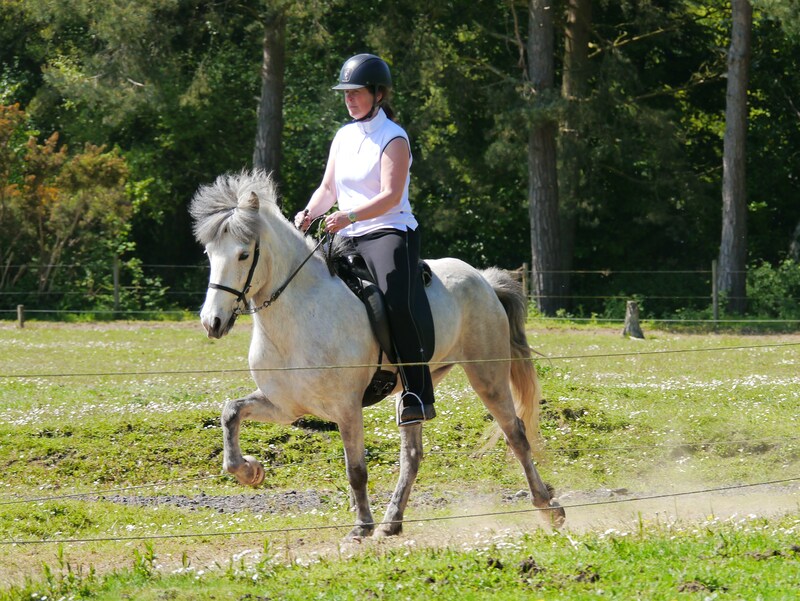 The thing is, now I look back she was right, I am still working on it, but my riding is significantly better now. 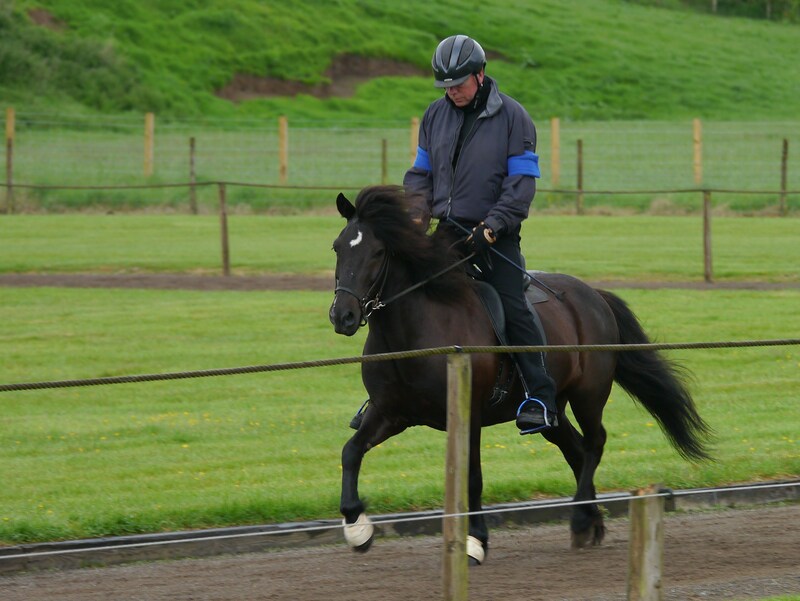 After her feedback I made a determined effort to stop ‘wiggling’ in the saddle and Janice made a significant correction to Rogers riding position too, which he has maintained ever since and his back problem has not returned. We continued to research, got help and lessons from Fi Pugh at Old Hills Icelandic’s and that summer we took Fleygur and Beanie to the Gower Peninsular on holiday, and on one particular day riding over the Common at Cefn Bryn I commented to Roger that Fleygur really wasn’t pulling, even though we were heading back to the yard. 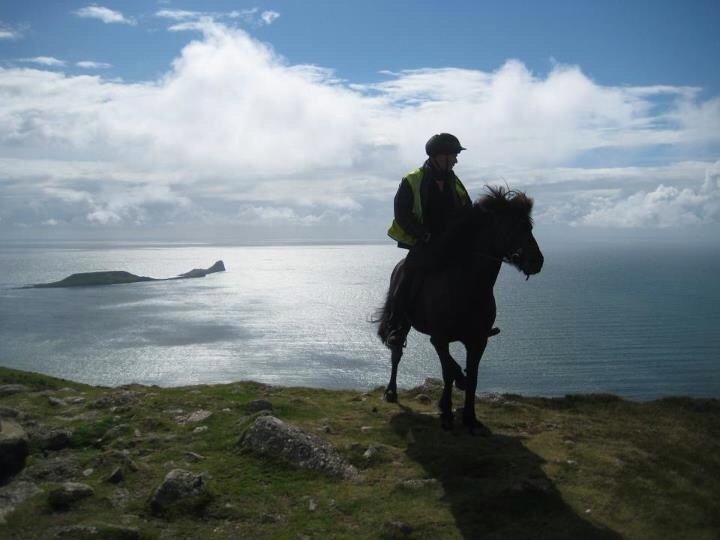 We swapped horses and Roger rode him the rest of the way home. He announced that it was like riding a different horse. I was so chuffed. Although this was a break through the problem wasn’t fixed and there were plenty more challenges to come, but now at least we knew that we could give some release to Fleygur and that returning to a softer feel was not out of the question. As Fleygur became more relaxed and his bond with Roger grew stronger his character really began to shine through. He has become so relaxed at home that Roger often doesn’t tie him up and I really think he would go anywhere with him. It was around this time that Fleygur began his celebrity career, I started his Facebook page and later the website and YouTube channel. 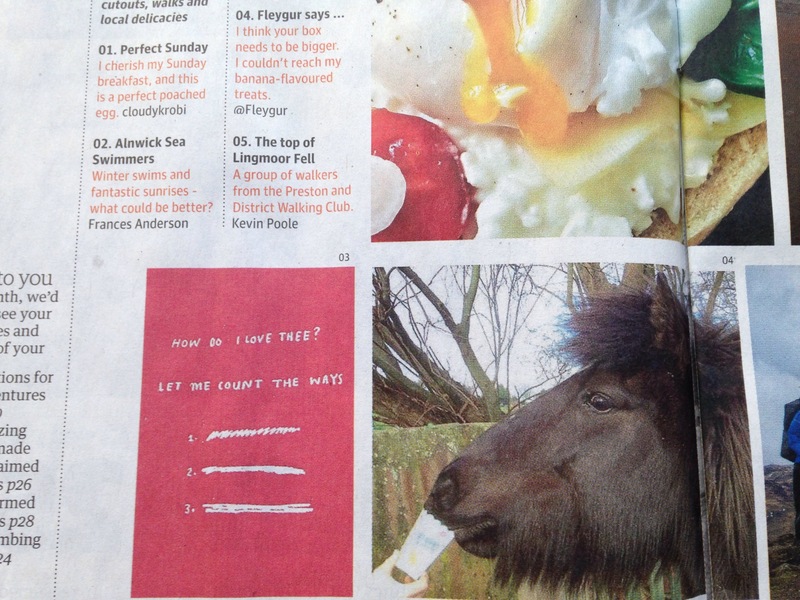 Later that year he even got short-listed in the Finals of the Equestrian Social Media Awards 2014 (Talking Horses category) and got his photo in the Guardian Newspaper! Clearly it was time he had his own logo too, designed by a colleague. 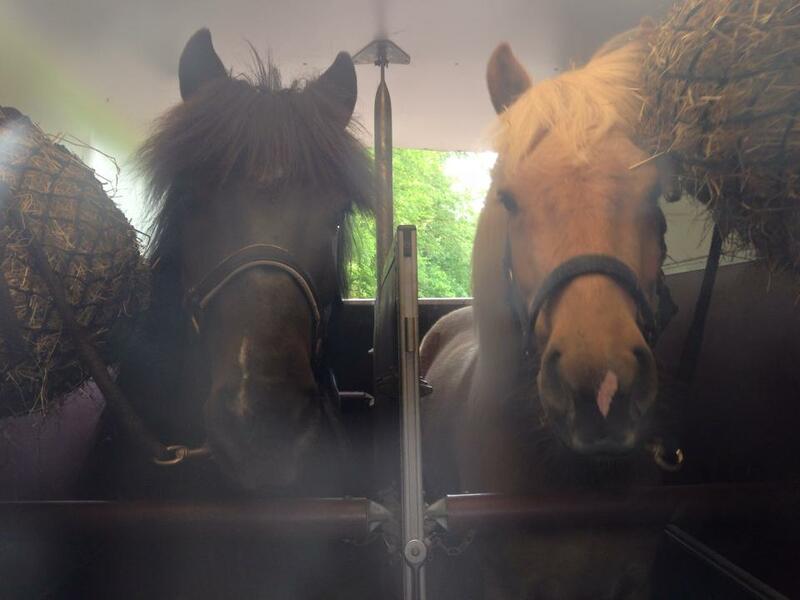 We started taking Fleygur to clinics (or Boot Camps as LVH calls them) at Old Hills Icelandic’s and had lots of good advice from Karen Birgitte Rasmussen and began to think about shows…. 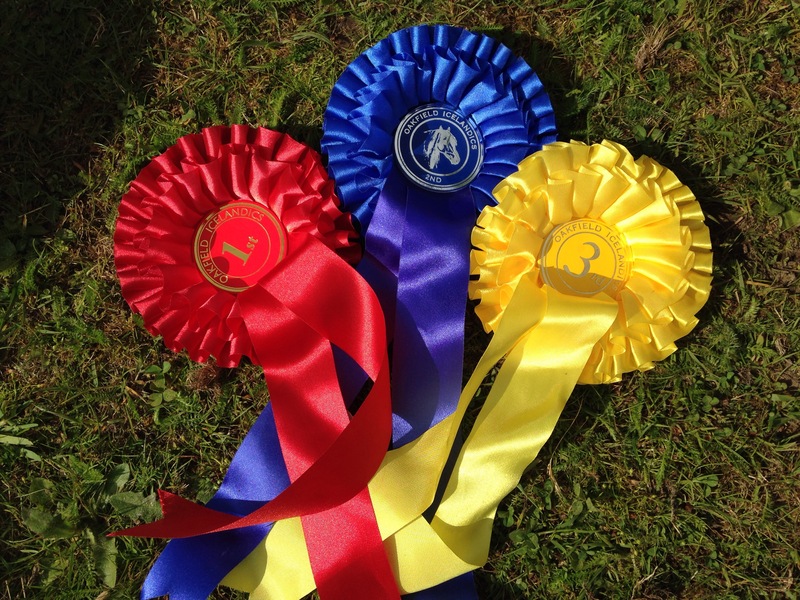 The first show we attended was the British Championships in 2013. You can read Fleygur’s account here, but believe me he underplays what a disaster it was! Fleygur was barely controllable, and shouted the whole time for Gydja. Roger tried his best to calm him, but nothing seemed to work and he scored a very low 1.8 in his first ever class. Despite putting a good face on it, and lots of encouraging comments from people, Roger was gutted. 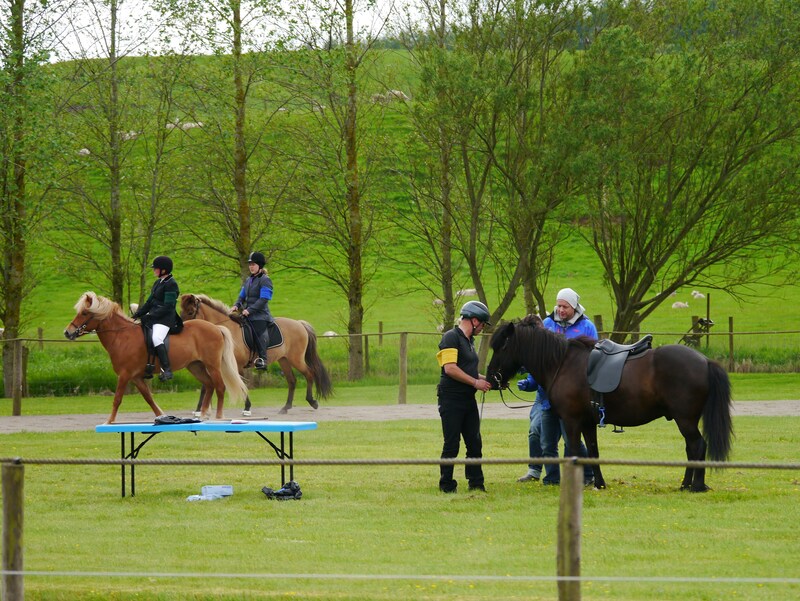 We attended more clinics and started to attend shows at Oakfield Farm in Dorset. These were much more relaxed events where we were able to work on Fleygur’s separation anxiety. He still shouted a lot but his did sometimes put in some quite good performances and at the next British Championships in 2014 were he was much improved and brought home the shields for Elementary Tölt Champion and Elementary Combination. However his anxiety constantly hampered his performance and even though he was often placed in his classes he was still too stiff, too ‘upside down’ and often called out for his mates. We had a long way to go, and had begun to question whether taking him to shows was really fair on him, as he got so wound up. 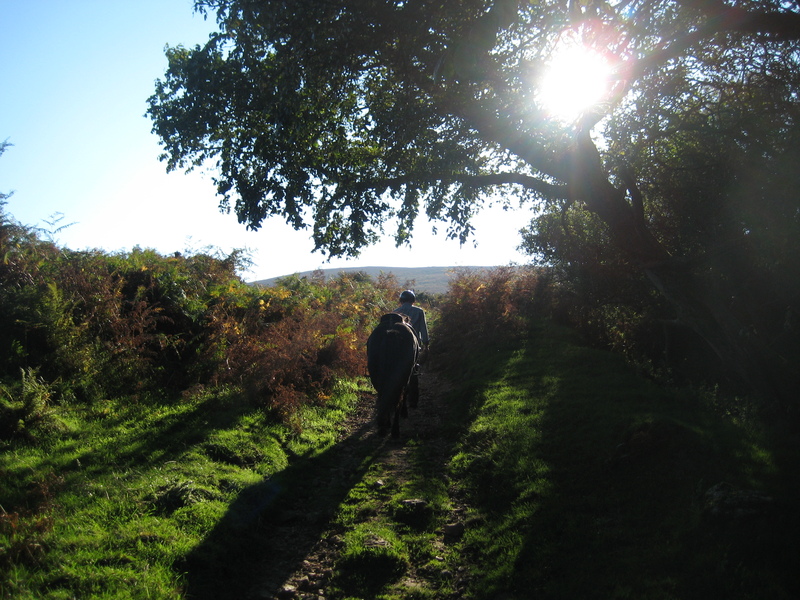 Quite how far we still had to go became most apparent when Roger took him on his own to a team training event (otherwise know by Fleygur as ‘Mega Boot Camp’). He travelled well on his own, but once at the event he called – all night and when Roger rode him the next day he was exhausted and tense, this was not a winning combination. It was a tough weekend for Roger and although he got some good advice about preparing for the Easter Show the following weekend his confidence was not high. Fleygur was entered in two classes but when we got to the show it was clear he was not feeling himself. He was subdued and didn’t eat all the food provided – which is unheard of for him. He played it all down a bit in his Easter Show Report but we were worried about him. Roger withdrew him from one class, and declined to ride in the final of the other. 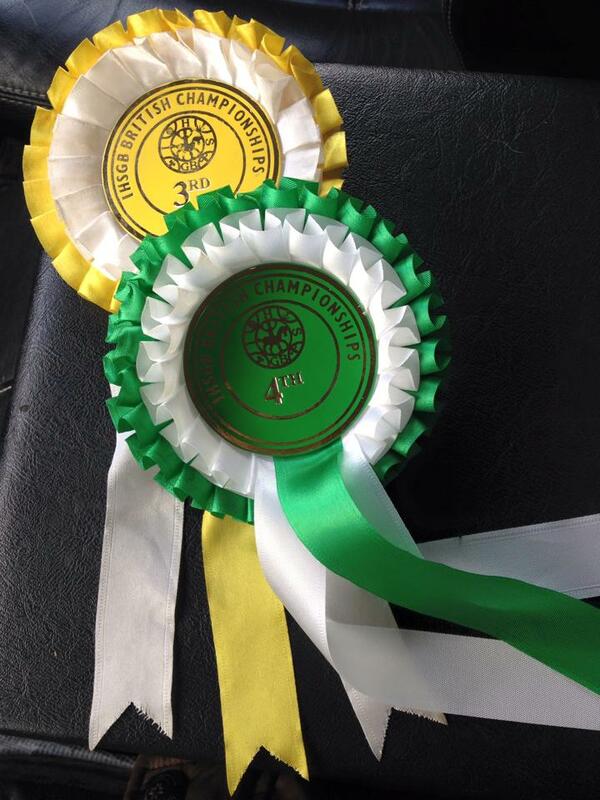 For the first time Fleygur came home with no rosettes. Had it all been too much for him? Was it fair to keep asking him to perform on the Oval track when he got so tense? Had he gone as far as he could? Perhaps it was time to gracefully retire him from competitions and for Roger to concentrate on bringing on our new youngster, Jandi. We decided to give him one more go at the Spring Show at Oakfield Farm Icelandic’s. It was a place Fleygur had been to several times, and the atmosphere there is relaxed. 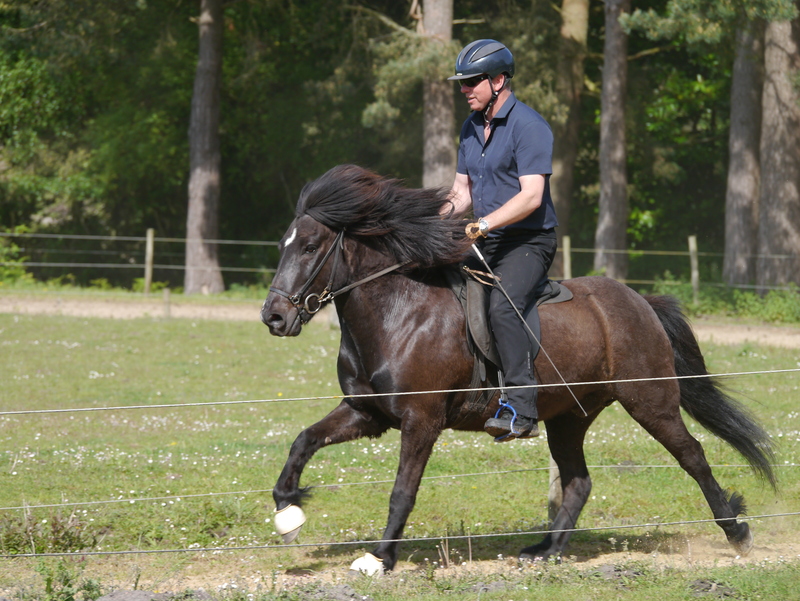 Roger entered him in two intermediate classes, Tölt and the Four Gait. We would give it one more go, and decide whether or not to take him to the British Championships in June based on this. As we attended more shows we had progressed from me having to hold Svipur near to the track to keep Fleygur calm, to me walking with him in hand after Roger had warmed him up. This meant that Roger could watch the other competitors and concentrate on what he had to do in his next class while I focussed on getting Fleygur to relax. I kept him moving and focussed on me, talked to him and knew where he liked to be scratched or massaged best. 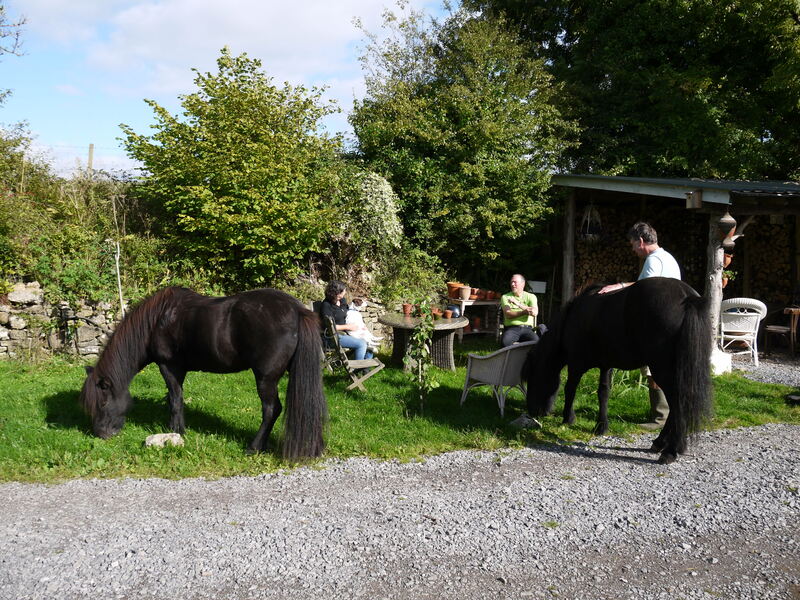 It seemed to work and both Roger and Fleygur were more relaxed entering his classes. 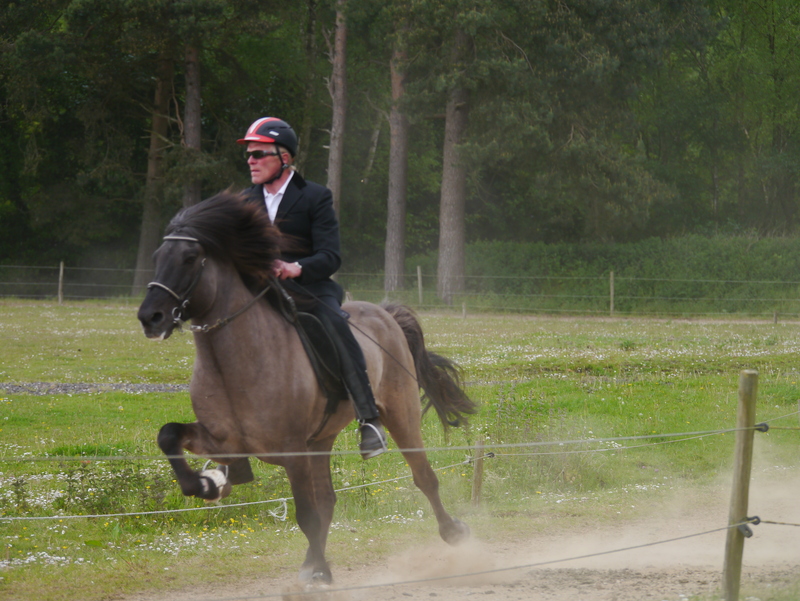 We couldn’t do this for the Intermediate Tölt as I was riding Svipur in this class too, but probably because he had Svipur with him he stayed calm and went on to win the class. He performed well in the Intermediate Four Gait too going on to win second place with a score very close to the winner, but it was not his placing that pleased me the most. 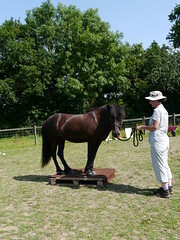 It was how much more relaxed he was, and although he still needs to bring his hind legs under him more, and we need to try to help him be less stiff in his back, his shape was much improved – and he didn’t shout! Well maybe once. He just looked so much more relaxed. This video shows the tolt section of his Intermediate Four Gait class, there is still more to do, but for anyone who saw him at his first competition in 2013 this is a huge improvement. 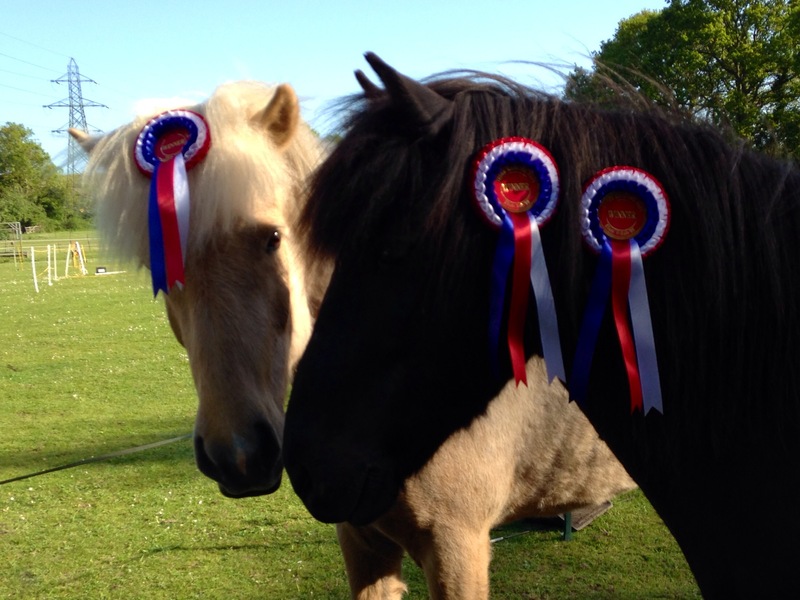 Svipur and I got a third in the Intermediate Tölt and Roger and I were also presented with our Winners rosettes for the 2014 Rider Rankings. So the Spring Show was a big success for the Little Viking Horse. It was a lovely show with good food, great company and excellent hosts. 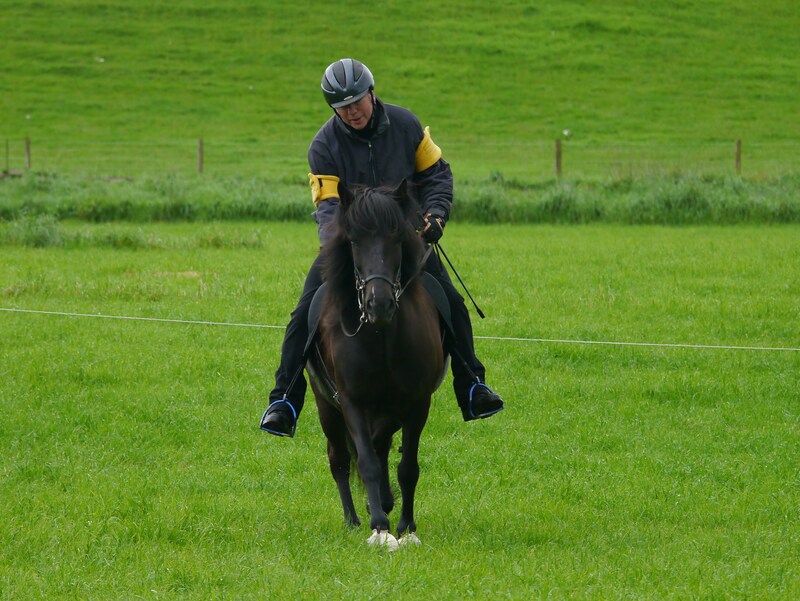 When we started with Fleygur we knew next to nothing about Icelandic horses and the gaits and sometimes I still feel I know nothing, but what I do know is this – being with our horses should be fun. It could have been the right decision to withdraw Fleygur from competitions, it’s no fun seeing your horse so stressed and at some point he will retire from being a ‘sports horse’ and just be a rambler instead. 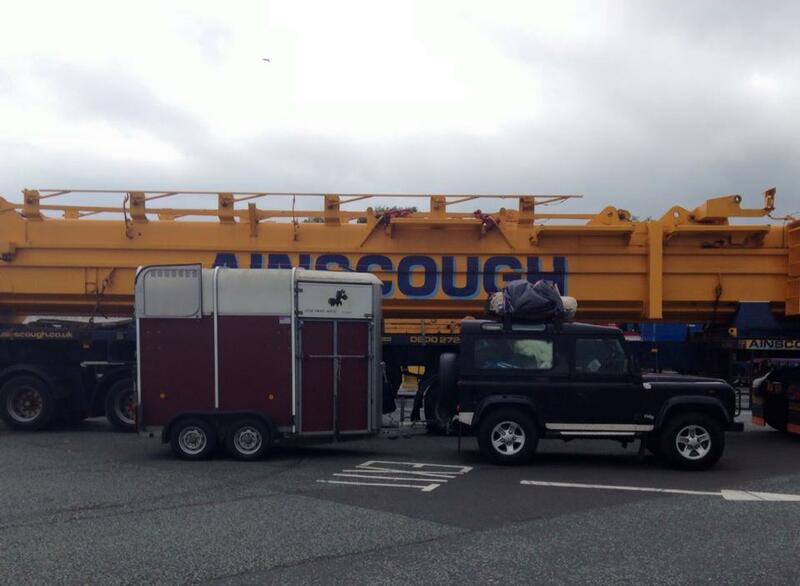 The competitions are actually a small part of what we do with our horses. It’s not all about winning but knowing that you are making progress and being recognised for that is a wonderful feeling. 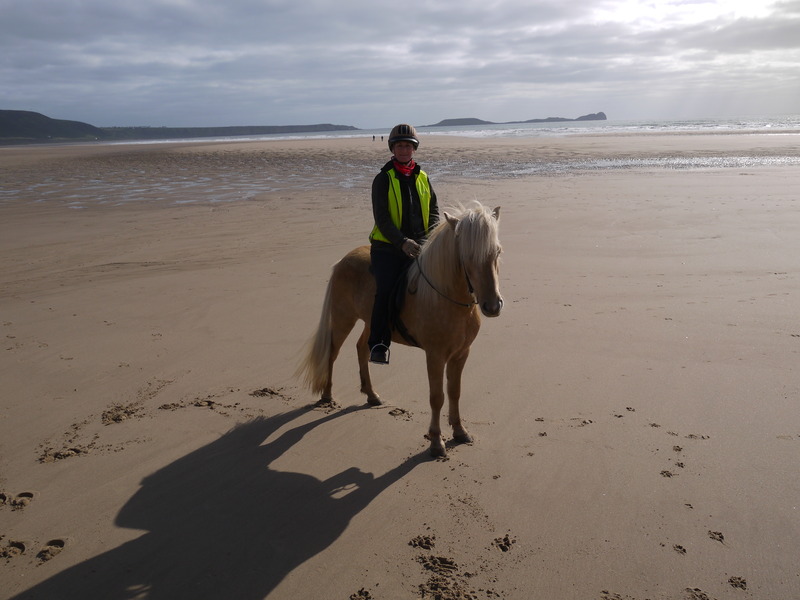 The Icelandic horse community in the Britain is welcoming and helpful and there are many people who’s advice and help we have sought along the way, so thank you to everyone who has been part of our journey so far. A final few photos from the Spring Show. Five Gait Class. Riders of all ages. Who said Icelandic Horses can’t jump! Roger wonders how a horse that can be so calm and cooperative, while out hacking, can be so wound up, and mad at a competition. Basically Fleygur does not like to be separated from his mates, and this is probably the biggest challenge. “Rather tense and slightly pacey, but improving. Straight on the diagonals” NB Fleygur was ‘screaming’ at this point! ” Tenses on circles, and not fully co-operative. Rather uneven tempo at times. So a lot of room for improvement! At this point, Fleygur and Svipur were on the same score. Here is his second performance. Isn’t it amazing? 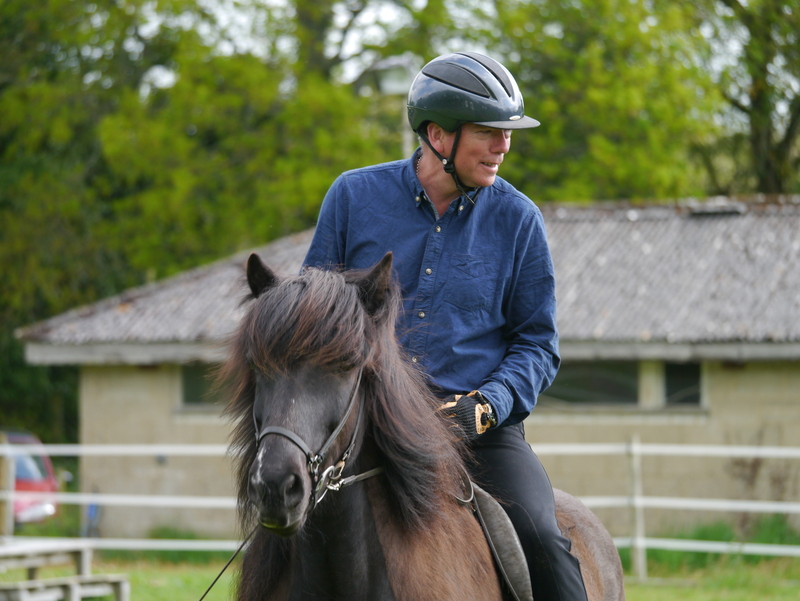 I think Roger looks so calm, and controlled on horseback – and all that is going on in his head, and in his ‘seat’! Plenty of work to do before the Spring Show, in Verwood, Dorset. 2nd to 5th May. Watch this space! 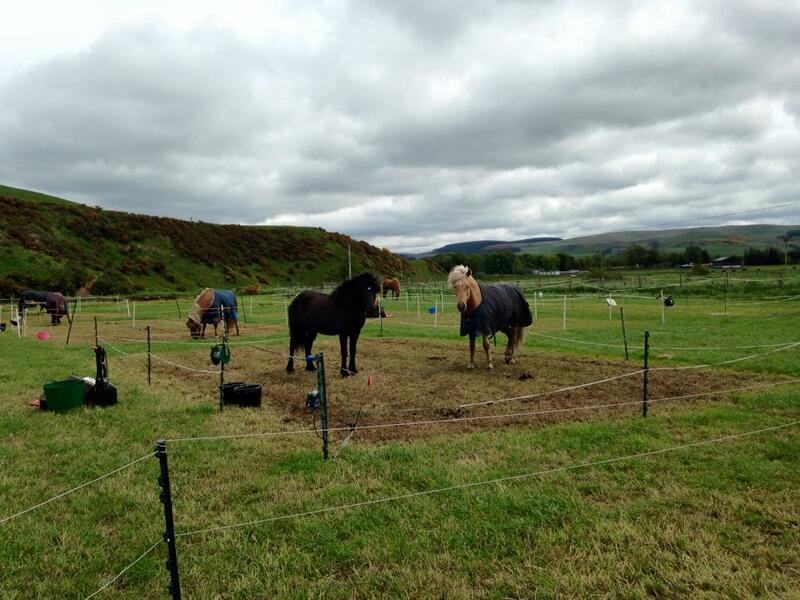 Fleygur has shared his experiences of the U.Ks first Tolt in Harmony Competition in an earlier blog, and has posted the links to the YouTube videos. There is a lot to be gained from watching the other performances too, and I will certainly be studying them hard, to see what I can learn for Svipur and myself. I was very nervous about taking part. 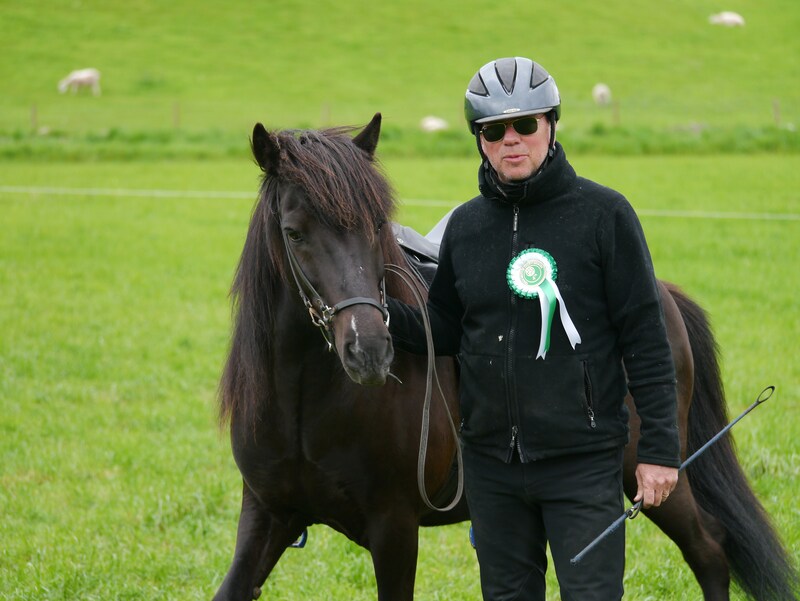 I have never ridden in an Icelandic Horse competition before, or even very much in a school, and it was my first time at such an event, with my young horse, Svipur. I did so much better than I expected, and the encouragement and support from all the others was great. I think that Tolt in Harmony is a great event. 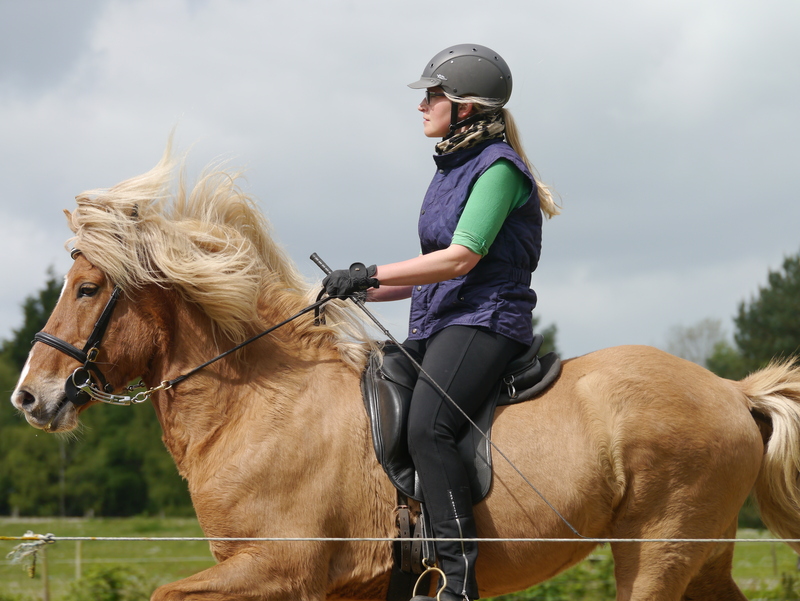 I really wish to be the best rider I can be for my horse, and for us to go in harmony. 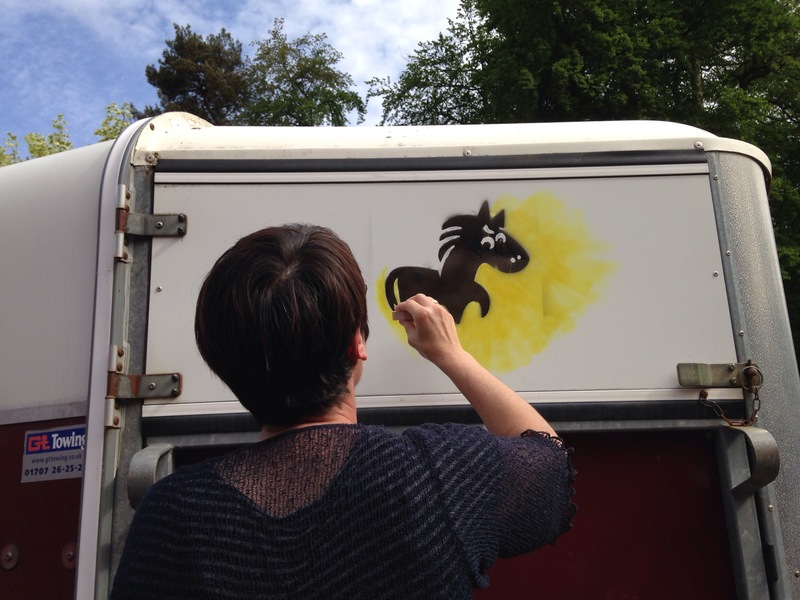 I am concerned that many equine competitions lead to rough riding, and dubious methods, so I really wanted to support something that is designed to promote harmony, and does not value flashy action over the welfare of the horse. He slowed down every time we got near the gate, and was reluctant to go forward in the last section. 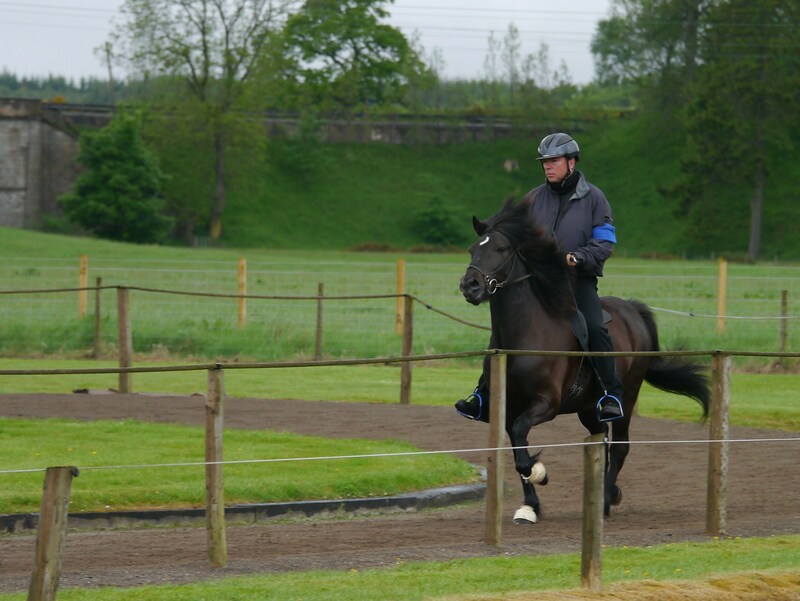 I was trying to give a longer rein for the walk, following feedback from the practice round, so that he could stretch out and relax, but I ended up with uneven reins, and not a straight line! Something to work on. So, here are the judges comments that go with the performance on video. Judges comments for Roger and Fleygur to follow in the next post.